PICTURE: Dylan Foster, 8, Mia Anderson, 12, Chudy Isidienu, 11,principal Felicity House, Adelle Hams, 8, Jack Findlater, 15, Jocelyn Mouna, 15. PETER Carnley Anglican Community School’s new welcome sign features greetings that reflect the diverse community in an around the school. The sign is fast becoming popular, with other schools reportedly contacting Poolgraves Signage about the design. 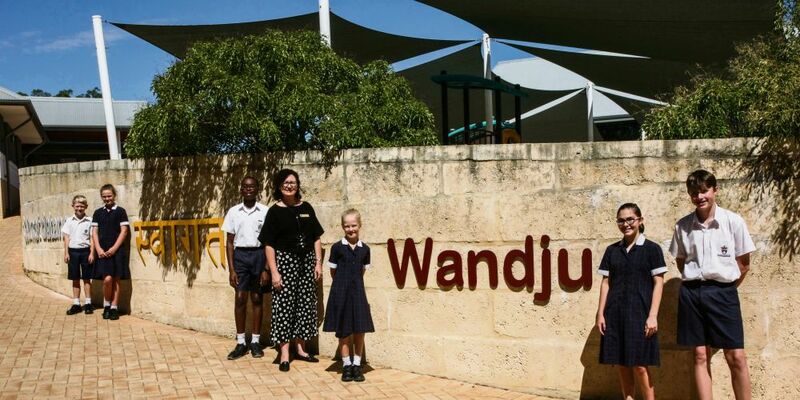 Head of IT and Operations Shane Parnell said an Aboriginal liaison officer recently conducted a walk-through of the school and suggested first impressions were important in making families feel welcome. The school also hosts study tours for international students at the Wellard Campus so the concept of a ‘welcome wall’ was developed. The initial six languages chosen include English, Noongar, Hindi, Indonesian, Chinese, and Italian which is the language study option offered by the school. Eighty percent of students attending the school are Australian-born, but many have overseas-born parents. The remaining 20 per cent of enrolled students represent 36 different countries, principal Felicity House said. A Maori greeting will soon be added to reflect the significant number of New Zealand-born families in the area, and the signage was installed on the school wall to coincide with Harmony Week celebrations in March. “The colours for each word come from the colours on country flags, and the Noongar word Wandju represents the red earth of our land. “Our plan is to add to the wall as time goes on,” Ms House said.